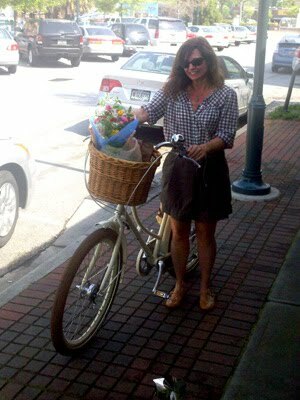 It's a gorgeous sunny Saturday, and Jenny rides her beautiful ivory Velorbis bicycle to The Gourmet Shop for brunch with a friend. They make a stunning pair, don't you think? A documentary about the history of efforts by certain companies to control public light-rail transport. Links page from the official "Contested Streets" site. We live in Columbia, South Carolina. We ride our bikes to work, to the grocery store, to go shopping, to share a meal or a drink with friends. You don't need special cloths or funny shoes to join us -- just a bike. Wear whatever you want to be wearing when you get where you're going. If it's cold or drizzling, put on a sweater and a coat. Relax, ride easy, listen to the birds.